This book is the story of Tom Dickinson's mission to visit all 92 Football League grounds in one season and to eat a pie at every ground. It really was a mammoth undertaking and quite impressive given that he wasn't getting paid to do it. This story holds a special place in the history of Pierate. We chose to review a Potts Pie for our first ever pie review because it was the pie which Tom said was the best of the 92. We have also started our own football pie league. Here is the long overdue Pierate review of the book itself. Tom carried out his quest after finishing university, putting off getting a job for one more year by travelling the country to all 92 matches. This was during the 2008/2009 season. I felt some kindred spirit with Tom, we both finished uni at the same time. In 2008, whilst he was planning '92 Pies' we were planning a pie review website called 'Pierate'. The rest, as they say, is history. To seem like I am being nice I will start with the positive comments. Firstly, I want to make clear that I really enjoyed reading this book. It was often funny enough to make me laugh out loud. I think Tom's sense of humour really struck a chord with me. It was very well written considering Tom is not a professional writer. The observations he made at the various matches gave quite an insight into many football clubs I haven't been to and it left me with a longing to visit more grounds myself. The book was divided up into 92 chapters, largely just talking about each match with little discussion of what was happening in between. This made it very digestible and quite easy to dip in and out of. Somehow Tom managed to make each chapter interesting, despite the fact that it could easily have been very repetitive. I know how difficult it can be to make our pie reviews interesting given the repetitive nature of the beast. Tom managed this by clever observation of what was going on around him in a way which reminded me of the most illustrious of travel writers, such as Bill Bryson, except that Tom seemed to drink a lot more alcohol on his trips (a worryingly large amount in fact!). 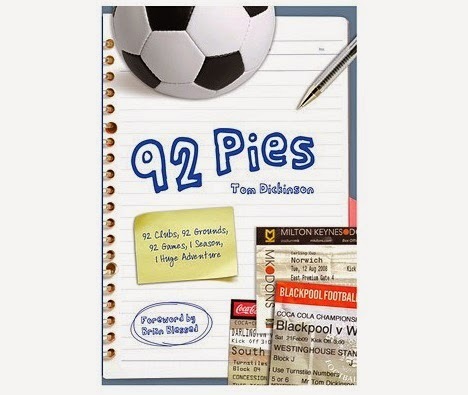 However, my main criticism with the book is that, considering it is called '92 pies', it DOESN'T REALLY TALK ABOUT PIES. I admit, I might be slightly abnormal in my manic obsession with pie, but it left me a bit disappointed. The book is after all called 92 PIES. In general he talks about the journey to the match, the match day experience and the match itself but quite often he doesn't even mention the pie AT ALL. He stated his mission was to buy a pie at each ground, but did he actually do it? I couldn't be sure. Actually, I was quite sure that he didn't have a pie at each ground because disgracefully he found that Charlton DIDN'T EVEN SELL PIES. Tom had to make do with a slice instead. Remind me never to visit Charlton Athletic. I was left wondering if Tom even liked pies very much. Quite often he complained about having to eat yet another pie. He makes it seem like he ate a horrendous amount of pie. At most he had two in a day (there were a couple of times he did two games in one day) and he had a couple of stints of 7 consecutive football matches in 7 days. Well, let me tell you Tom that real pie lovers don't even complain if they have to have pie for every meal for a week! Actually, I did complain a bit.... But seriously, it isn't that many pies, I don't see what all the fuss was about. He stated that by the end he would be happy never to see another Pukka Pie again. It was like eating pie was a huge ordeal for him which I cannot even begin to understand. Considering this I ended up doubting whether I could trust Tom's recommendations on pies but, nevertheless, I will summarise his thoughts for you here. The rankings are taken from the back of the book and this is the only time he really scores the pies apart from one pie at Colchester which he says is '7 out of 10'. He also had good comments for the pies at Bournemouth, Macclesfield, Accrington, Cardiff, Preston, West Ham. He also had great comments about Brown's Pie Shop in Lincoln City centre (he did also eat another pie in the stadium). He obviously ate a lot of mass produced branded pies too saying that the Shire Chicken Balti pie was fast becoming his pie of choice (which we have also reviewed) and had negative views on Wrights pies. I am not quite sure what was so bad about the Walsall pie, when we visited the season after Tom, we found they also sold Shire pies, perhaps they changed their line up in light of his criticism? He didn't even talk about the Walsall pie in the book! The highlight on the pie front was that he was given a tour of the Greenhalghs bakery in Bolton before his final match. Despite having criticised Tom's knowledge and lack of comment on pies he does admit that it was never meant to be about the pies. He took on the challenge after a dare from a mate. He wanted to rediscover his love of football and understand what makes the football league so special. It was just because the media latched onto the pie side of things that it became known as a challenge about pies. Really it is a book about football, pure and simple. As a lower league fan myself I found his comments and experiences interesting. One last comment though is that considering Tom was trying to find what makes the football league special he did describe a lot of games as pretty terrible. I appreciate that sometimes you do have to sit through a lot of turgid matches. However, if you are a life long fan you will sit through it and you are rewarded by those magic moments which come along every now and then. The highs just can't be beat. I hope Tom did appreciate that, there was a lot of complaining from him about the lower leagues, in fact I think he said more games were rotten than he said were good. But for a neutral it just is never going to be as exciting. He did still seem to come away having enjoyed the experience overall. Finally, I would just like to say thanks to Tom Dickinson, not only for the great book, but also for the publicity he managed to get for the humble pie. We try our best to raise the Pie-rofile but Tom was doing this before we even began, thanks Tom. I hear Morecambe do an Irn-Bru pie now, meet you there for a pie next season if you can face them again? Condition - 5.0 out of 7 - Well presented and appealing. Colour - 4.0 out of 7 - Some good colours on there, but a bit too much white. Cheapness - 5.0 out of 7 - Think it was about £10. Capacity - 5.5 out of 7 - It was actually a suprisingly long read. Chewiness - 5.5 out of 7 - Plenty of football observation to mull over. Content - 5.5 out of 7 - Interesting throughout, perhaps felt a bit long at times but then it were 92 matches to cover. Consistency - 6.0 out of 7 - A consistent writing style and it worked well, our first 'Pierate Recommended' which isn't actually a pie.